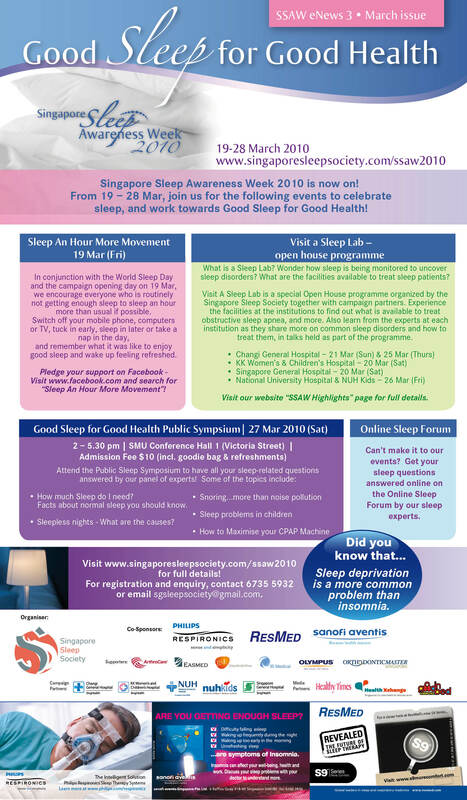 Here are our eNews that you can download and send to your friends and families, help Singapore to achieve Good Sleep for Good Health! How many hours sleep on average do you get a night? How many hours of sleep a day do you think you need? 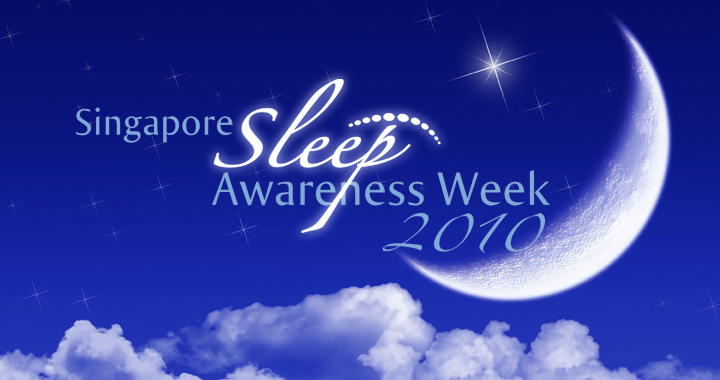 The Singapore Sleep Society organized the Singapore Sleep Awareness Week 2010 from 19-28 March 2010, in celebration of the World Sleep Day. 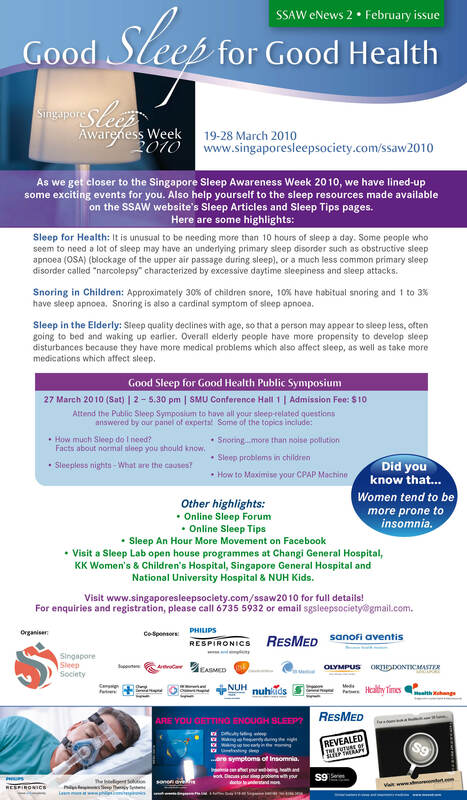 SSAW is an inaugural campaign in Singapore to increase the public awareness of sleep-related issues, and aims to educate the Singapore public on the importance of good sleep and about some common sleep disorders. Through this campaign, we hope to help those with sleep problems better understand their sleep disorders and what options are available to best treat them. This 10-day campaign featuring sleep-related activities to make learning about sleep disorders accessible, informative, interactive, and interesting to everyone. The campaign has now closed. We hope you had an opportunity to join us at SSAW 2010, where we hope you have learned more about sleeping well, have your sleep questions answered through our Online Sleep Forum. The Sleep An Hour More Movement on Facebook attracted enthusiastic response, and the Good Sleep for Good Health Public Symposium was well-attended by over 250 attendees. Do browse through this website to find out more about the events and activities lined up for SSAW 2010, and make use of the online sleep resources. 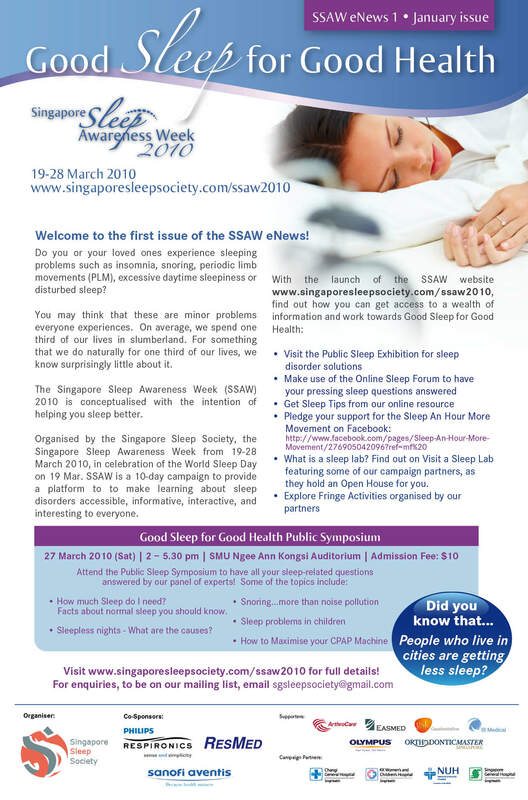 For enquiries on Singapore Sleep Society, please contact us at admin@singaporesleepsociety.On behalf of the Singapore Sleep Society, we would like to thank all our co-sponsors, supporters, campaign partners and media partners, for your enthusiastic support to SSAW 2010.